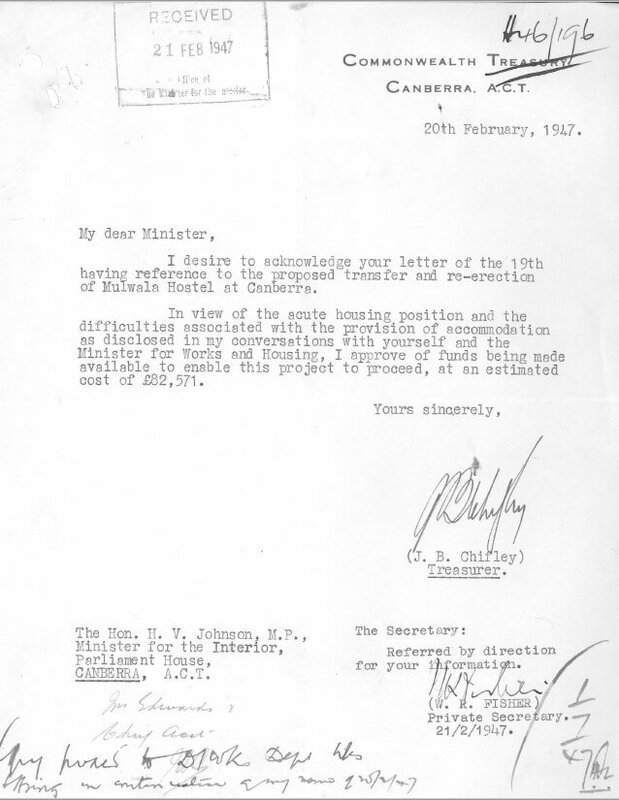 In 1946 Canberra was facing a crisis… new public servants were arriving from all over Australia to take up new posts in the Commonwealth government, and our developing city was unable to keep up with the demand for government housing. 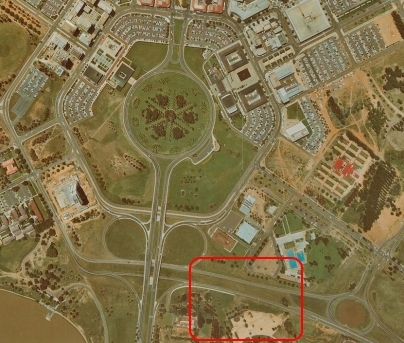 Whilst plans were already underway for two permanent hostels in Braddon and Barton, the requirement for housing in Canberra had become urgent. 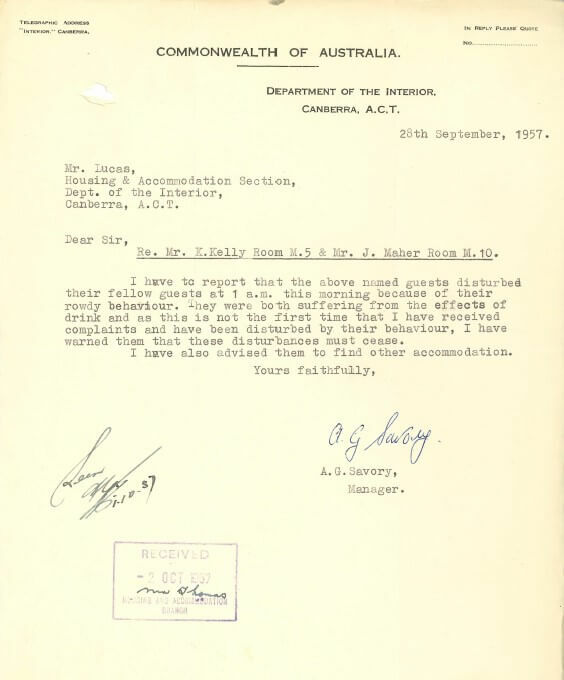 Under pressure and with a steadily rising waitlist, the Housing Officer for the ACT wrote to the Minister of the Interior citing the situation as ‘acute' and requesting approval to erect a temporary hostel in Canberra. The newly vacated war workers' hostel at Mulwala was recommended as a good solution, easily transportable and quick to re-erect, and with some minor adjustments able to offer accommodation for up to 144 people. From the food provided, to the rooms and shared facilities, Mulwala House was designed with young white collar singles in mind and our records reflect their lives accordingly. 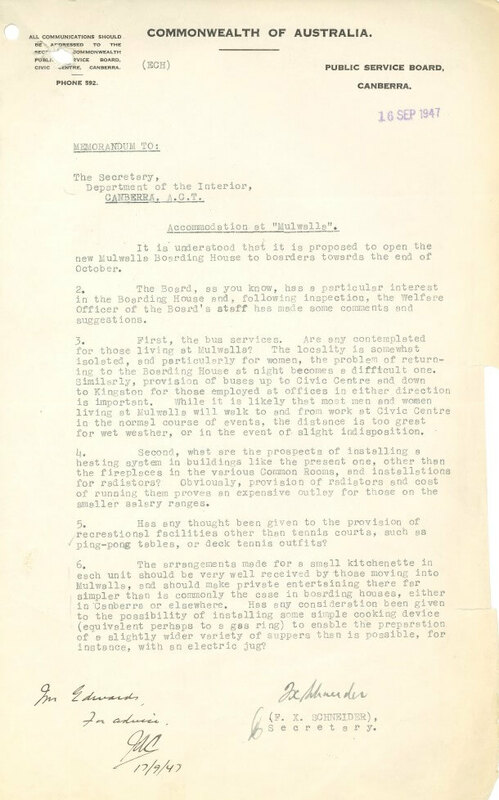 With the ACT Public Service celebrating its twenty fifth anniversary this year its seem fitting that the 1946-49 records on the living arrangements and conditions of the public servants of Mulwala House be explored in our February Find of the Month. Mulwala is a small town on the banks of the Murray River in New South Wales. With a man-made lake and access to a beautiful river it is a popular place for tourists. The permanent population, however, has historically been small. 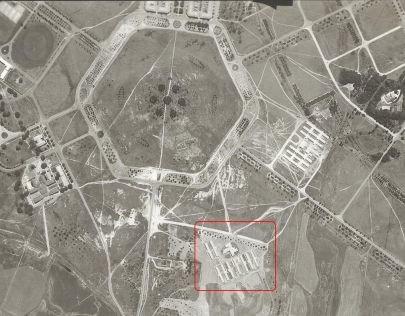 During World War Two the Department of Defence built a large explosives factory in Mulwala, which caused the population to temporarily swell as over three thousand civil construction workers were brought in to build the 600 acre development. With such a large influx, the Herald reported that a ‘whole town, including a community centre, was built to house 1200 workers and their families’. 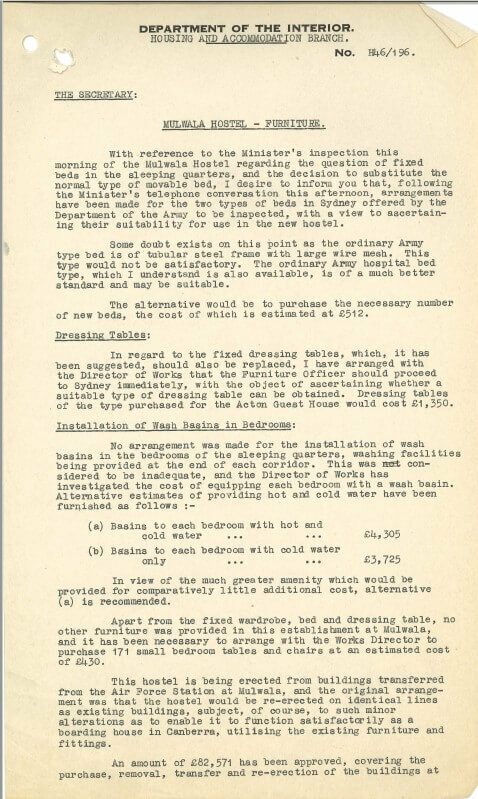 Finished in December 1944, at the tail end of the war, the factory never really reached full capacity, leaving no ongoing requirement for the war workers' accommodation. 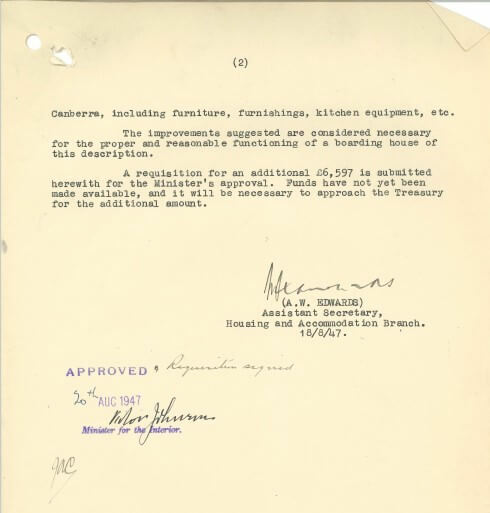 In 1946, the accommodation was declared available for disposal, and the Department of Works was quick to see a potential solution for temporary accommodation in Canberra. After a successful tender process Mulwala House was approved for transfer by the Treasurer and soon-to-be Prime Minister J.B. 'Ben' Chifley. The final build would include six accommodation blocks of 24 single rooms each, a community centre and a block for staff quarters. As no double rooms were available, Mulwala House was to be populated by young singles, specifically white collar workers of both sexes. 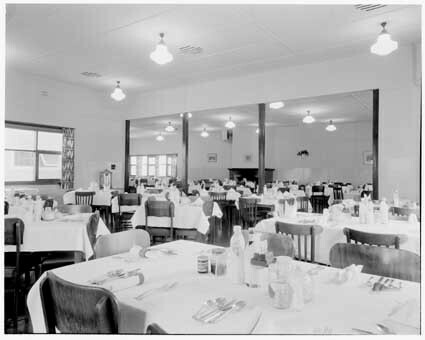 The community centre featured a central kitchen and was designed to seat and feed up to 150 people. A recreation room was also included, and access to a public phone. Although it took some months, due to the unavailability of phone lines, the number F834 was eventually allocated, and we should all take a minute to appreciate that three digits were much easier to remember than the 10 digits we have now! Once the buildings were completed the Minister of the Interior was offered a tour. The Minister was unhappy with the room amenities and made several suggestions for changes including upgrades to the beds, dressing tables and the provision of in-room wash basins, in addition to the shared bathrooms on each floor. Our records show that this decision would cause the Department of the Interior some headaches down the track with some female residents complaining of inappropriate behaviour and harassment at the hands of management. The Public Service Board also raised some issues regarding the new accommodation. With no bus services the Board considered the location to be ‘somewhat isolated’, and noted that returning to the location by foot after dark could be quite difficult. The Board also requested that kitchenettes, central heating and recreational facilities such as tennis courts be considered. Of these requests, two were addressed, with a new bus route being added to the time table and electric jugs being allowed in rooms. Guests of Mulwala House would be charged up to 3 pounds and 5 shillings a week for room and board, which would equate to about $210 a week today. The first record regarding potential guests speaks of the immigration of 40 female typists from England. It’s hard to imagine a time when typing, something we take for granted today, was an in-demand skill! Placing these young women was a priority, and arrangements were hastily made to welcome them to Canberra with accommodation at Mulwala House. 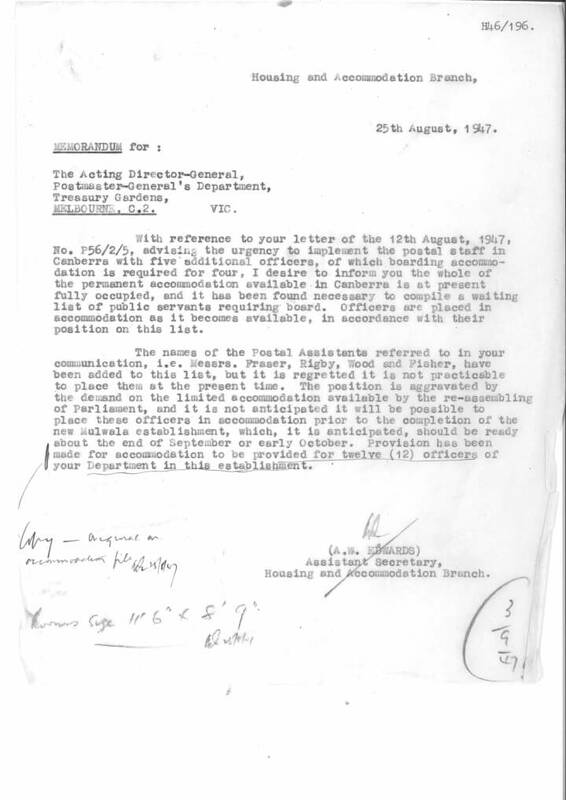 Commonwealth Departments were all equally keen to find room for their new staff, and the initial allotment of guests by the ACT Advisory Council came under fire, with questions regarding the order of registration and preference. 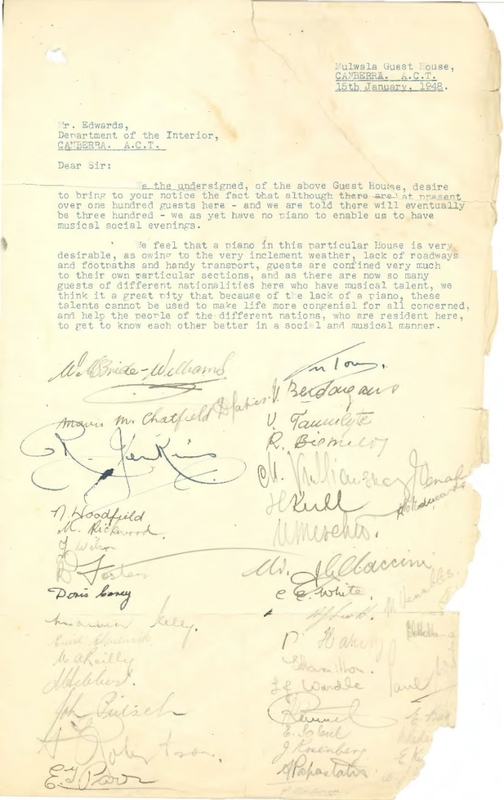 One of the early guest lists shows that staff were placed from a variety of different government areas including Treasury, Forestry, the Institute of Anatomy, Attorney General, Hansard and the Tourist Bureau. 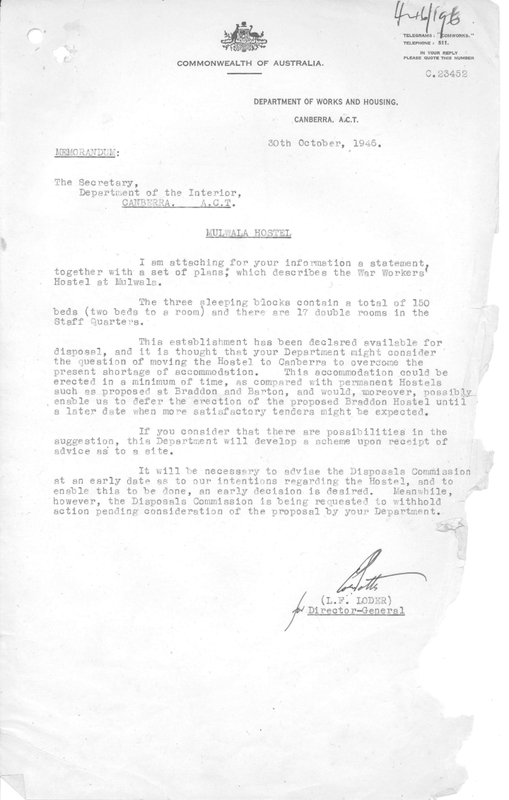 Staffing of the Hostel was also proving difficult, mostly due to altercations with management and one dismissal of a waitress even caused staff walkouts and strikes. Come up to my place and live it up! 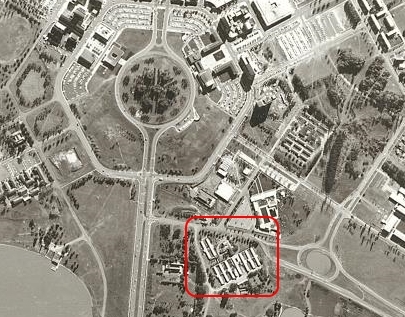 In the 1940s the civic centre of Canberra clustered around the Melbourne and Sydney buildings, and although Mulwala House was placed on the city side of Commonwealth Park, the residents felt isolated from the city. Transport after dark was almost non-existent and residents had to find their own amusement. 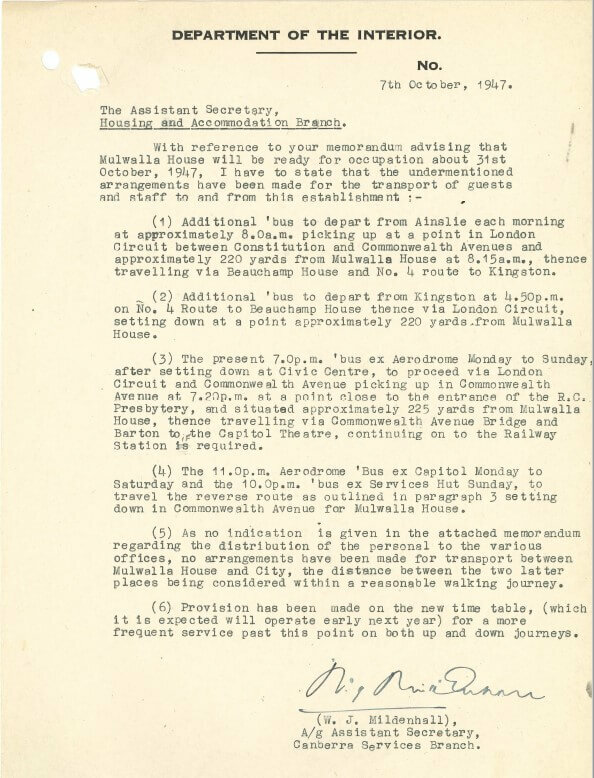 Recreational facilities at Mulwala House were limited, and residents went to the length of signing a petition in 1948 requesting a piano for social evenings. Further improvements included: new cooking equipment, a larger serving area, an outgoing pillar mail box, additional phone lines, bicycle racks, table tennis, a billiard table, basketball and tennis courts. Residents formed social sporting teams and youth groups and enjoyed concerts arranged by the Canberra Arts Council, which included ballroom dancing, concert performers and choral singers. Some residents even found love with the Canberra Times reporting on the wedding of two residents in 1957. Not everything was perfect however. As you would expect with such a large residence there was the occasional vandalism and theft reported, with bicycles most often the target. Romantic liaisons (well after visitor hours) resulted in threats of trespass. On a more serious note, there were also reports of attempted molestation, peeping toms, stalkers, drunk and disorderly behaviour, punch-ups and suspected overdoses. This seemed to get worse as time went on, and by the mid-50s there seems to have been a shift from outside disturbances to inappropriate behaviour by guests and staff. Sanitation and food quality were also hot topics. 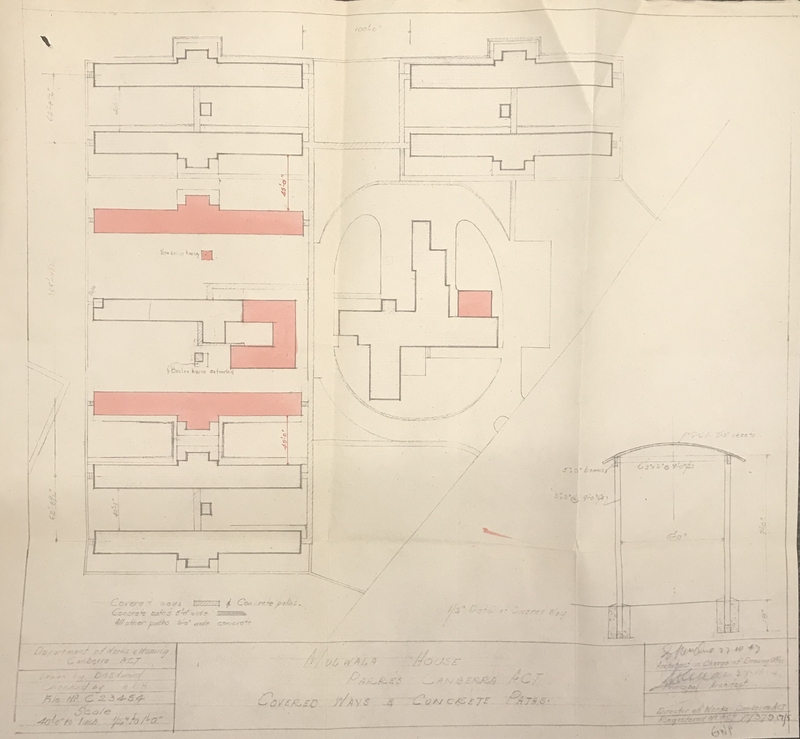 An outbreak of scabies in 1948 saw an inspection of the site, with changes recommended to the sewerage traps, staff dining room and quarters. Further investigation in 1950 showed running water under all the living quarters as stormwater drains had never been fully provided. A look through the records shows that the food quality varied year to year, with complaints about bugs, serving times and poor quality meat. 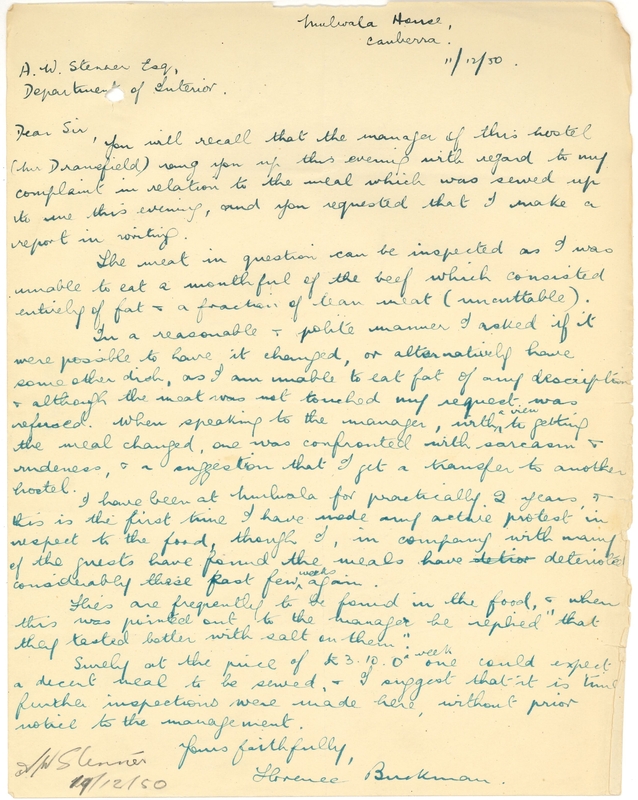 When one resident complained to the manager about flies in her food in 1950 she was told they ‘tasted better with salt on them'. The Manager of the house towards the end of the 1950s seemed to draw the ire of many residents. There are many complaints on record regarding his manner and tone in responding to residents on accommodation matters, for cultivating favourites, and for entering female guest’s rooms without knocking. In fairness it should also be noted that at the same time there was also an increase in evictions, mostly issued for breaking noise restrictions. In 1957 one young lady was evicted for playing “Rock and Roll Gramophone records”. 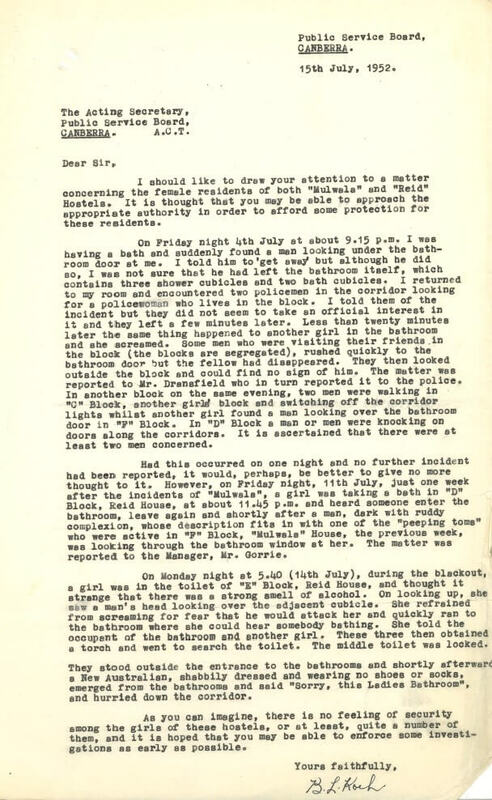 Other causes for eviction included ‘entertains unsavoury types’, ‘drinks’, ‘entertained a man after hours’, and ‘personal belongings are very dirty’. I found the life at Mulwala was good… there was a tremendous atmosphere. It was small and you knew everyone, not like here (Macquarie Hostel) where you can’t get to know very many people. The buildings themselves would be demolished on 21st April 1969 heralding the end of Mulwala House. 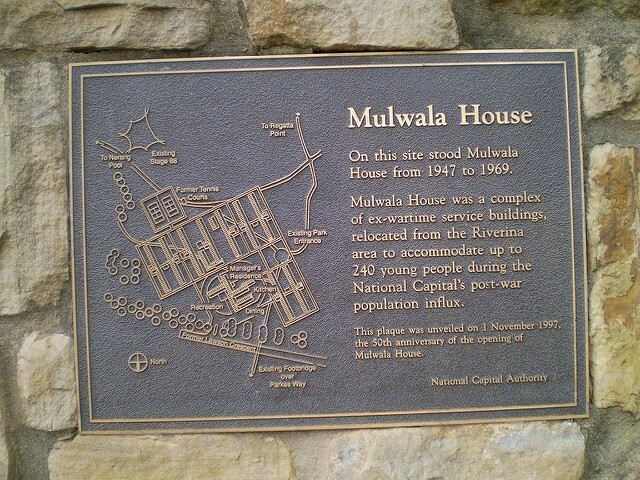 In 1997 the National Capital Authority dedicated a plaque in Commonwealth Gardens on the remaining site of Mulwala House, and some of the original plantings can still be seen in the vicinity. If you are interested in visiting the site, the ACT Government and the National Trust for the ACT has prepared a guide to help you identify its location. Have you stayed in a government hostel in Canberra? Drop us a line at archives@act.gov.au or tweet about it and don’t forget to include @ArchivesACT.